2.1 Who is this product for? These days, just about everyone wants their own binoculars for various reasons. No matter what you want or need binoculars for, you still need to select the correct kind of binoculars for your needs. Many people need affordable, simple yet effective binoculars. The PowerView binoculars are made by Bushnell, the sports optics industry leader for more than 50 years. Let’s explore what this compact pair of binoculars has to offer. The PowerView binoculars are a compact, high-quality yet affordable product. No matter what you need to use them for, you will find these binoculars useful and effective. They combine Bushnell’s traditional durability and quality with contemporary design and styling. They are economical, easy-to-use, and have general-purpose roof prisms. They can also sustain rough and active use thanks to the black rubber armoring. These binoculars also include a neck strap and carry case for comfort and convenience everywhere you go. These binoculars are ideal for bird watchers, nature and wildlife enthusiasts, sports observers, concert goers, and tourists looking for a compact pair of binoculars. 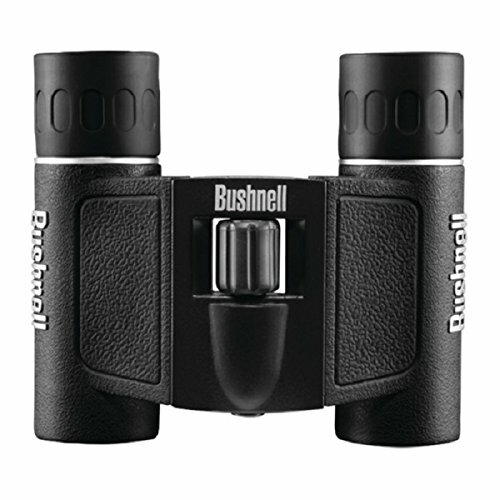 The Bushnell PowerView Binoculars package includes a soft, handy carry case to protect your binoculars, a lens cloth, and a neck strap which provides you with the convenience and comfort needed for outdoor activities. The carry case also has a Velcro strap. so you can attach it to your belt. There are not many binoculars in this price range that have used prism Bk-7 glass, which improve the optics of this product dramatically. Their design is also roof type, which means you get crystal-clear vision when using these. Binoculars with roof prisms use more complex optical systems that have higher production costs and end up being more expensive than other binoculars that have different optics. Luckily, Bushnell has managed to keep the cost down while keeping the quality high. The roof-prism glass paired with the fully coated optics makes this a top choice when selecting from this category of binoculars. The Bushnell PowerView binoculars boast a fold-down feature, which means they are conveniently foldable, allowing you to easily store them in your pocket, purse, or on your belt. These binoculars have an 8x magnification and a 21-millimeter objective lens, allowing you to have an impressive 378-foot field of view at 1,000 yards. They also have a 21-foot close-focusing distance. The center focusing system allows you to quickly and easily sharpen your view, so you don’t miss a thing. They weigh just 7 ounces, making them perfect for anyone to use, no matter how old or young. The non-slip black rubber armor protects the binoculars and allows them to absorb shock when in use. As these are compact, they can be difficult for night use as insufficient light enters the lenses. The eye holes are also quite small, so you need to put in some extra effort to see objects clearly. Another disadvantage is that they are not fog or waterproof. Although this is not necessarily a problem, it does limit you to how and where you can use them. These binoculars are lightweight, but there are times when it would be convenient to mount them on a tripod. Unfortunately, the Bushnell PowerView binoculars are not tripod ready. These binoculars are simple to use, allowing the whole family to enjoy them. Simply fold the binoculars out to the appropriate distance for comfortable viewing, and use the center focusing system to focus your vision. These compact binoculars are sturdy and durable and offer BaK4 prisms with multi-coated optics offering clear, crisp images. They have 12x magnification and a 26 millimeter objective lens. They are also fully waterproof, allowing them to be used in any condition where they may be splashed. However, they cannot be submerged in water. The Xgazer binoculars are a great pair of all-purpose binoculars. They are waterproof and fog proof and have an anti-glare coating on the lenses. They have 10x magnification and a 25 millimeter objective lens. They are very popular among birdwatchers, wildlife enthusiasts, and fishermen, offering a compact option that is also rugged and durable. Although they are not the best binoculars in the market, the Bushnell PowerView binoculars provide excellent value for your money and offer competitive features. They are compact, lightweight, foldable, fully rubber coated, and high quality, not to mention they are made by one of the top manufacturers in the binocular market. Those looking for a pair of binoculars for general use will love these and will appreciate their versatility. It is easy to see why these would be a great pair of binoculars for everyone for many different practical uses. Trail Camera Mounting Height – What Is the Right Height? Some recommended products may use affiliate links. WildLifeChase.com is a participant in the Amazon Services LLC Associates Program, an affiliate advertising program designed to provide a means for sites to earn advertising fees by advertising and linking to Amazon.com. Amazon and the Amazon logo are trademarks of Amazon.com, Inc or its affiliates. Copyright © 2018 Wild Life Chase | All Rights Reserved.